I predominantly focused my talk, and this article on Facebook Live and that is because in our experience it delivers much bigger audiences that the other social networks. That said, you can do pretty much everything covered here on Twitter too, and really it come down to where your audience is. 1. In synch with broadcast - if you are streaming alongside, just before, or directly following a TV broadcast. 2. The content is so important that the audience really needs to see it straight away. 3. Interactive - if you are going to offer a level of interactivity to the audience that simply isn't possible on demand. There is a perception that videos should be short and sweet to get maximum reach. However, that is actually not the case. Based on our experience, a video with a stream length of under 8 minutes will on average reach an audience of a few thousand. As the stream length increases to between 8 and 20 minutes, the audience increases to between high thousands to low tens of thousands. Make the video longer still (20-45 minutes) and the audience could rise to millions of live viewers. After 45 minutes, the audience still grows, however what we then find is the average viewing time drops. Therefore, the optimum length is between 20 and 45 minutes for the maximum number of engaged live viewers. Having completed 145 Facebook Live streams since April this year, I can honestly say that all types of content work. We have done live streams for films, TV channels and programmes, musicians, politics, magazines, and many more. The key is ensuring whatever content you are streaming is engaging and of the right length. We can split the audience for live video into core, soft, and super soft. The core audience are those people that have already liked your page and will see your content direct. They are likely to be the most engaged having already expressed an interest in your business. The soft viewers are attracted by seeing shares and likes from the core viewers. They may well view the live stream and have some level of engagement, especially if they have common interests with their Facebook friends they found the stream through. The super soft are viewers who are very casual, unlikely to view the live stream, but will read about it or view the highlights from news sources in the coming days. Engagement is of course minimal as they are unlikely to be watching live. Good content which is interactive or timely should deliver live views of around 15% of total page likes. However, in order to achieve that, it is essential that you promote the stream as much as possible before it goes live, on other channels as well as Facebook, or the social channel where your video will appear. Countdown content on your Facebook page also generally works really well and having a call to action, a reason for viewing, is essential for growing that audience. During my presentation I also cited a number of examples of live streams we have done that have ticked all those boxes. That includes a second screen experience live on Facebook for Coronation Street; a live stream of the premiere of a new drama, Outcast; live Brexit night content for ITN; and an escape room for Alibi. If you want to hear me talking about those, check out the video of my presentation here. 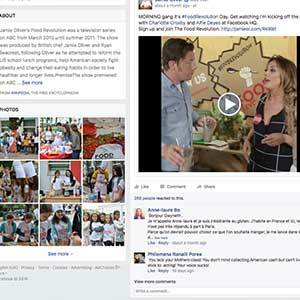 Live social streaming offers a wealth of opportunity to complement broadcast content. There is a lot of technology out there to make it engaging, and there is a lot of flexibility on what can be done creatively. This is leading to some really interesting ideas and experiments. Any form of content can find an audience, but you must make it engaging and interesting. If you can do that and make sure your target audience is aware of your upcoming stream, you can get a significant live audience and some great interaction.